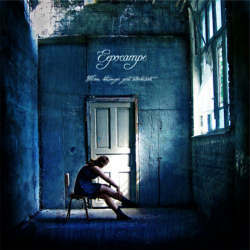 Eepocampe is a French post rock trio which was founded in 2005. In 2008 they released their debut album. Three years later it’s time for the successor When Things Get Abstract. The cover artwork isn’t very exciting, and the music also needs some time getting into. That shouldn’t mean that you should dismiss them, because closer listening will gradually reveal the band’s potential. Eepocampe are definitely not a revolutionary band and therefore don’t set out to reinvent the post rock genre. They use ingredients that might be known from artists like Mogwai, Explosions In The Sky and the likes. But all in all the three Frenchmen are acting quite diligently. They know their trade and also how to treat their instruments. The songs take their time to build suspense but eventually can become quite rousing, without ever neglecting the melodic component. I really like the dominant guitars that you can’t get away from and the distinct drumming that gives the song its propellant groove. The violins on Heart Of Volunteer are an excellent idea to procure even more variety. The title tracks is nearly ten minutes long and thanks to its different set of moods never fails to excite. The band’s heavier side is mirrored in Indecisive Minds. I also need to point out that the vocals play more than just a subordinate role. Antony Lourdel has a very pleasant voice, and during the longer instrumental parts, the band inserts spoken word parts to give the material more substance. Eepocampe use a lot of familiar ingredients, but their choice of awesome melodies makes sure that you won’t be bothered by that. The mix of melodic, dreamy and wild parts works marvellously, and sometimes, maybe not often enough, they even dare try more experimental stuff. When Things Get Abstract has turned out to be a great album that deserves to be taken seriously.